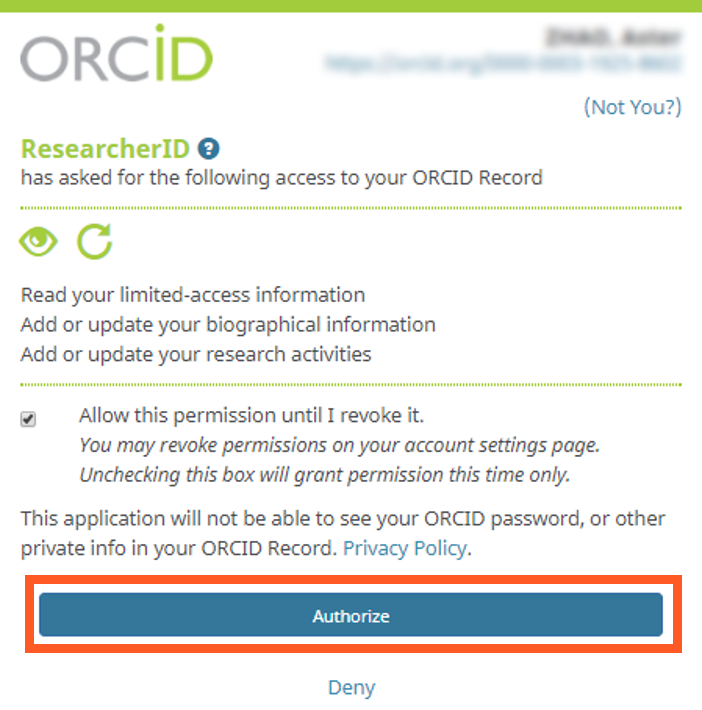 What is ORCID and how it helps in managing your research activities throughout your career? After you have registered for an ORCID iD, the next step is to add publications to your profile so that you can reap the benefits that your ORCID brings. Another way to do this is to integrate your ORCID with your ResearcherID. ResearcherID is the author identifier used in Web of Science. Unlike Scopus where the ID is automatically assigned, in Web of Science, you need to first create a ResearcherID and manually add in the publications from Web of Science database to your ResearcherID (see this tutorial). 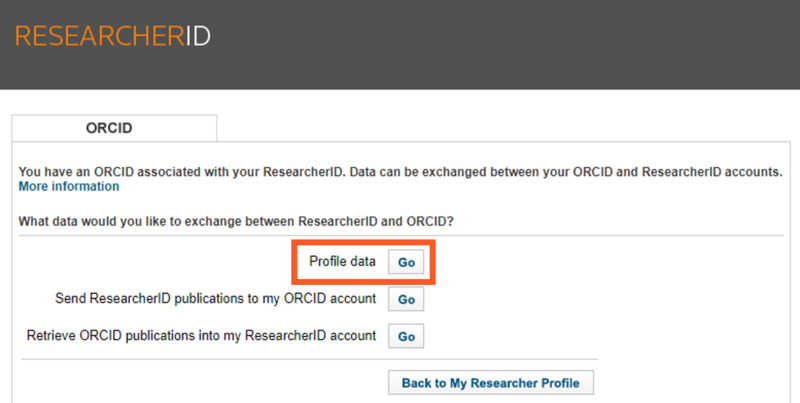 After you have enriched your ResearcherID profile, you can then link it with ORCID and push the publications over. Not everyone needs a ResearcherID - you may register one if Web of Science is a more recognized database in your research community. 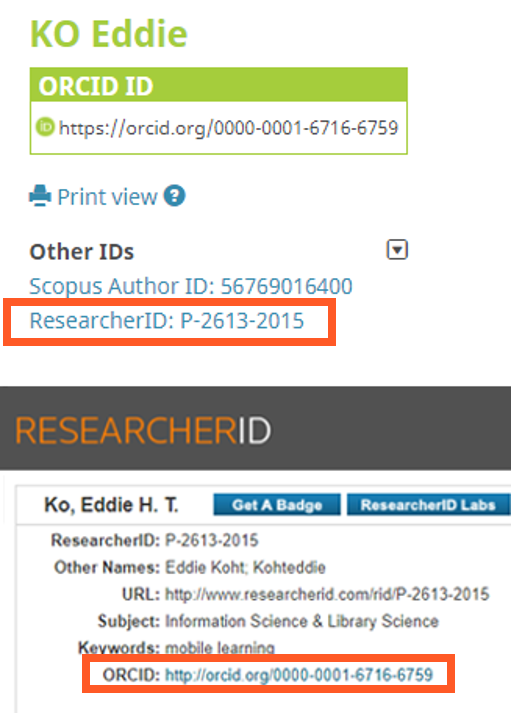 A good practice to managing author profiles is to first enrich ORCID with publications in Scopus, and then add publications from ORCID to ResearcherID (Option 2). This saves your efforts in manually add in the publications from Web of Science to ResearcherID. By adding works from ORCID to ResearcherID, the articles indexed in Web of Science will be automatically linked to the article page in Web of Science in your ResearcherID profile. You do not need to manually add in additional works since the works covered in Web of Science are covered in Scopus as well. ​Click "Forgotten your password" to retrieve your password if needed. 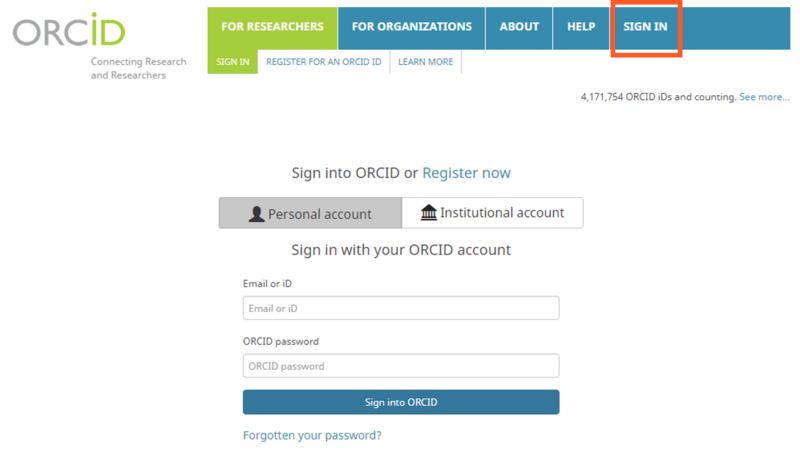 If you haven't got an ORCID account, refer to this page ORCID Registration to register a new one. Under Works, click “+ Add Works” and then “Search & link"
Click "Authorize" to allow ResearcherID to add publications to your ORCID profile. 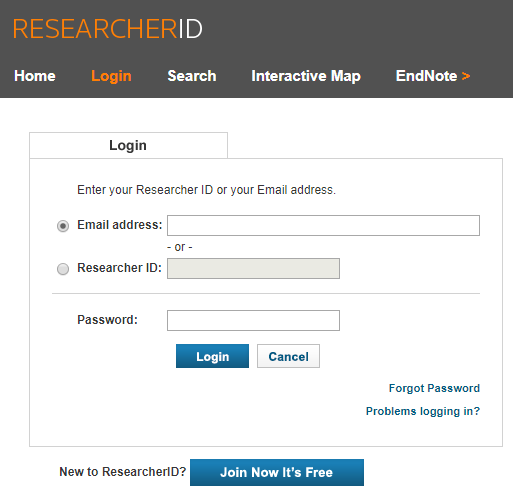 Log in with your email or ResearcherID. If you haven’t registered an account, click "Join Now It’s Free" to create one. ​Click "Forgot password" to retrieve your password if needed. Both biographical information and publications can be exchanged between your ORCID and Researcher ID accounts. 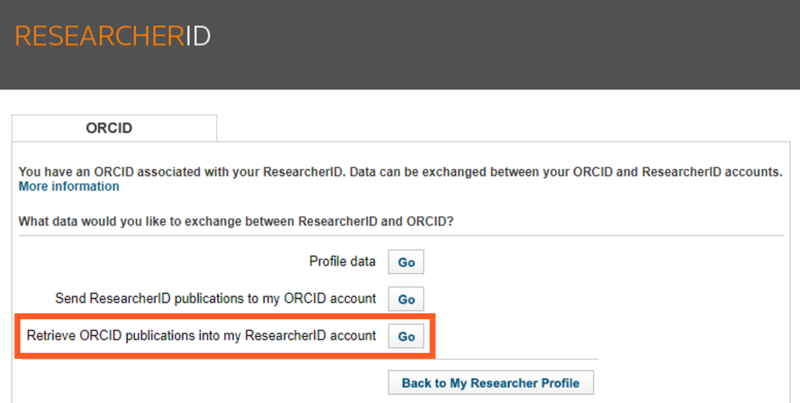 Choose "Retrieve ORCID publications into my ResearcherID account", if you have already added publications in ORCID (e.g. integrated with Scopus). 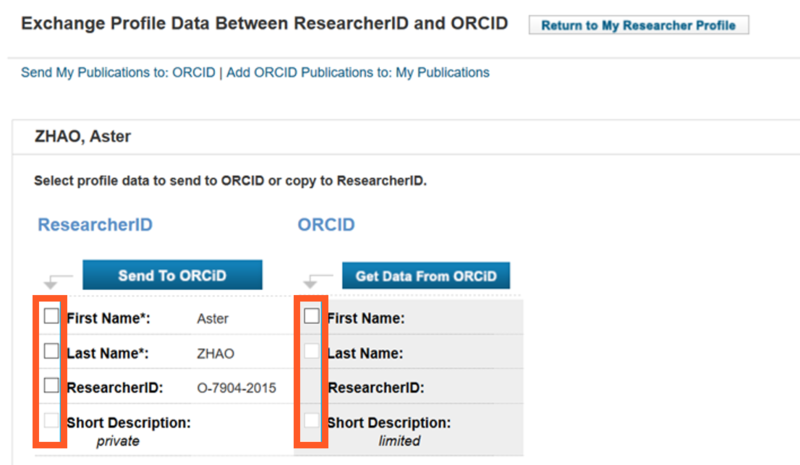 In this example, we select the first one - to push publications from ResearcherID to ORCID. 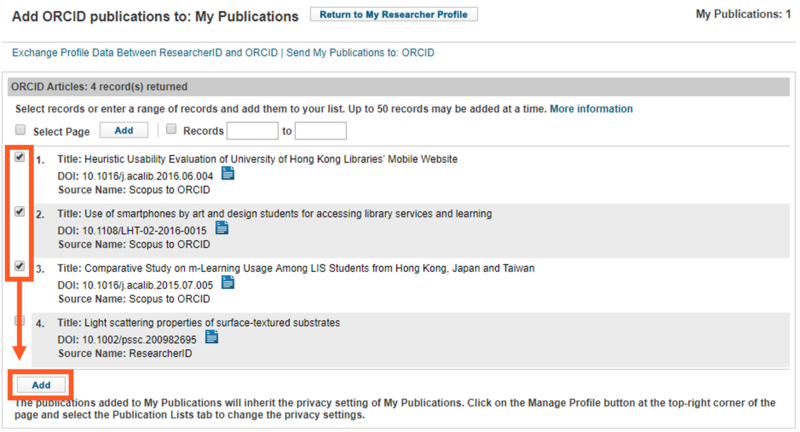 Make selections and send the selected records from this page to ORCID. The record(s) has been sent to your ORCID profile. To further edit the publication information in your ORCID profile, click "Make a copy and edit" button and make changes. Note that the original imported record cannot be edited in ORCID. In this example, suppose your ORCID profile has been enriched through integration with Scopus, and now it is ready to push publications from ORCID to ResearcherID. The records have been sent to your ResearcherID profile. Return to your ResearcherID profile to check the update. To further edit the publication information in your ResearcherID profile, click "Manage List" and then "Manage Lists with EndNote". You can update the bibliographical fields of any record through EndNote online. In this example, suppose you have a complete bio data in ResearcherID and would like to sync them to your ORCID. Choose "Profile data" and go. 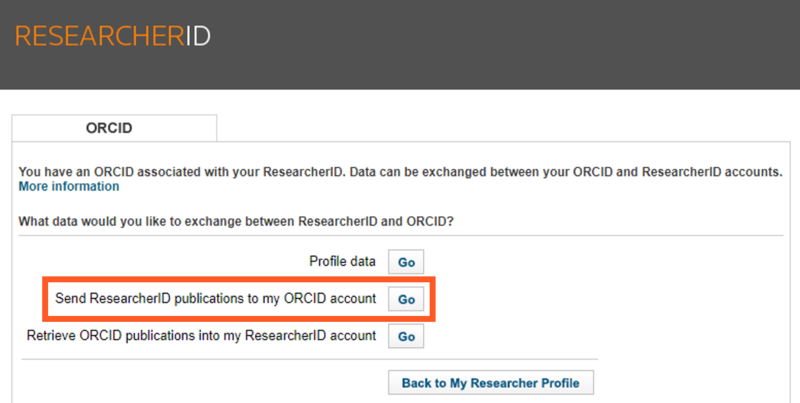 Select the fields you wish to sync information to ORCID, then click "Send To ORCID" (and vice versa). your publication list can be searched using your ResearcherID or ORCID iD on both Web of Science and ORCID platforms. Publications that are not indexed in Web of Science can also be manually added to ResearcherID and then imported into ORCID. ORCID platform will not display citation count of works. Nevertheless, it lets you seamlessly link to your profiles in Researcher ID, hence allowing you to quickly obtain citation numbers for your publications. (1) Click the URL of the work which has been added to your ORCID profile. 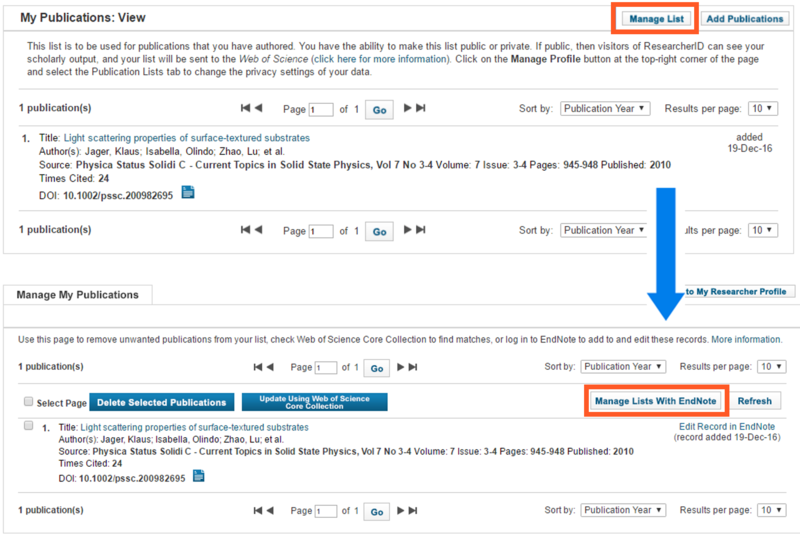 Given that the works are indexed by Web of Science, it will bring you to the database page and you will see the number of time cited of your works. (2) When your ORCID profile is associated with Researcher ID (from Web of Science), you will find the ID (with hyperlink) is displayed on your ORCID, by clicking the ID, you will be brought to the author profile page and you can find the author citation metrics. Publications that are manually added to ResearcherID will not have citation counts.